Sarah joined the nursing staff at the Aurora Animal Clinic in 2010. Working with animals has always been a dream of Sarah’s since she was a child. She attended York University with a special interest in Biology and Psychology for two years and then decided to make her dream a reality. She then attended Seneca College and received her Registered Veterinary Technician status in 2010. Though she was an avid horseback rider when she was younger, Sarah chose to go into small animal practice due to her special love of hypoallergenic breeds (as she is actually allergic to dogs, cats, and horses!). 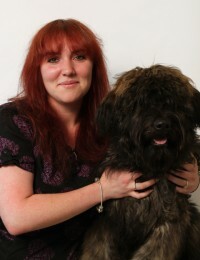 Sarah is the proud owner of a beautiful and busy Bouvier named ‘Illy’.